What we do in the name of beauty, vanity and fashion! During the Civil War women wore corsets laced so tightly they could barely breathe, and often fainted from lack of oxygen. Victorian times were no better, with women wearing everything from gowns made with arsenic-based dye to create a beautiful green colour, to flammable crinolines. 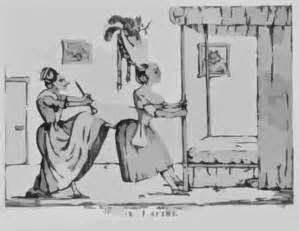 When fashionable women wore the wide based crinoline under their skirt or dress, they could very easily set themselves on fire not realizing how close the bottom of their skirt was to an open flame. It wasn't just those wearing the garments who died or suffered serious side effects - those working in the hatting occupation were working with poisonous mercury and suffered from mercury poisoning. Hence the expression "mad as a hatter"
Visit Deadly Victorian fashions to see the photographs and read more about deadly fashions. Thanks for the link. It was really interesting!